Almost 15 years ago, I was on the phone with Mike Mentzer. Yes, the champion bodybuilder who stood on the same stage with the mighty Aaaaarnold. I’d ponied up the cash for a series of phone consultations, and the great one himself was devising a program for yours truly. In addition to the usual goals, add muscle, lose fat, get strong, look great… he asked if I had any bodyparts that needed help. “My calves are scrawny” I told him. He sighed. Clearly he’d fielded this complaint hundreds of times over his career. He said, “calves are tough, they’re highly dependent on your genetics.” Then he gave me a strange piece of advice. He told me stop training my calves entirely and that the work my calves were getting from squats and deadlifts was enough – anything more could be causing overtraining in my calves and preventing them from growing. I was skeptical, but more than willing to try his approach. Ignore the muscle and it will grow? What could be easier? It doesn’t take a crystal ball to predict what happened next: Nothing. 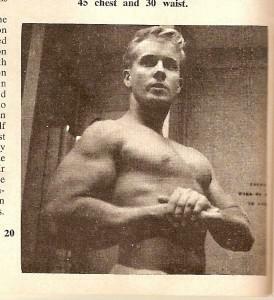 My calves didn’t grow and eventually I took my training in a different direction than what Mentzer preached. Over the years I’ve tried nearly everything to get my calves grow. From the “just don’t do it” Mentzer approach to twice-a-day calf training. But for my money, nothing beats the Jim Mclellan Crippling Calf Routine. Mclellan is a golf instructor now but back in the 60’s he was infamous for devising what just might be the world’s most painful calf training routine. As legend has it, when Jim first developed this program he added 1.5 inches to his calves in 8 weeks. Find a place where you can do standing calf raises with additional resistance. If you’ve got a standing calf machine at the gym, perfect. No calf machines in sight? Two options: Get inside the smith machine (don’t worry, we won’t laugh), put the bar on your back and stand on a 4-inch block. Or, you get a hip belt, tie on some weights and stand on a step. Start with 15 smooth reps. At the bottom of each rep, dip your heels as low as you can so that your calves really get a great stretch. And at the top of each rep, raise your heels as high as you can so your calves are forced to contract fully. Keep these reps slow and smooth. Immediately after your 15th rep, you’re going to “shake” your calf muscle. Here’s how it’s done: Leave one foot on the block, so you are still supporting the load with one leg. Take your other leg and try to get your calf muscle to violently “flop” around by shaking your lower leg. Do this for about 5 – 8 seconds, then switch legs. Then, do the shakes one more time for each leg. Now, do 8 more calf raises. Again, slow and smooth. Then, calf shakes again. Shake the left calf, then the right, then the left again, and then right again. Then, 8 more calf raises. By this point, your calves will be on fire… but the fun is just beginning. After the final rep, you’re going to stay on the block and immediately start doing “burns.” These are short, fast, bouncy calf raises. Don’t worry about dropping your heel as low as you can or rising up as high as you can on your toes. Just focus on speed – knocking out as many mid-range calf raises as you can. You should be trying to actually explode off the block — in reality your toes won’t leave the block but you should be trying to do these fast enough so that it feels like you’re about to lift off the block. Then you come crashing down and your calves are forced to stop the momentum. This will LOOK like you’re cheating — but what you’re really trying to do is torture the calves and do the burns for as long as you can. Don’t bother trying to count reps — you will be moving too fast for that. Just fight through the pain for as long as possible. When you can’t take another second, now it’s time for negatives. Stay on the block, and do a full calf raise with both feet, but then remove one foot from the block and lower yourself slowly using only leg. Lower yourself all the way to the bottom, then lift yourself up again with both calves. And at the top, remove the opposite leg and again lower the weight slowly using only one leg. Do 10-20 negatives for each leg. When you’re finished with these, take a 3-5 minute rest. Massage your calves, walk around a bit and give each calf a good stretch. It will be painful, but do it anyway. After the 3-5 minute rest period is over, do the entire routine again. After two weeks on the above routine, you’ll make the following change: After the negatives, add another round of “burns” and then another round of negatives. Making this change will help increase time under tension and keep the progress going. Ok, so that’s the basic routine. Here are a few additional notes gleaned from my conservation with Jim McLellan. #1) Train calves 4-5 times per week. The calves are brutally tough and they need to be punished over and over, many times in the same week to make them grow. #2) Use the same amount of weight for the entire calf training session. #3) Train calves first in your workout. #4) You don’t need to use heavy weights for this routine to work. #5) The key is punishing/torturing your calves. It’s all about how long you can deal with the pain. Do NOT be nice to your calves. #6) Don’t stop when you can’t get a full rep. That’s not failure. Keep going until you can’t raise up your heel even a single inch. When your calves are so fried that you can’t make your heel raise up even a single inch, that’s failure. #7) Most people with great calves go them from their parents – not from hard work. #8) If you were born with terrible calves, you’ll probably never have great calves. But you can improve on what you’ve got by working hard on this routine. 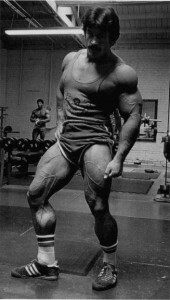 #9) Funny story: Back in the day Jim was training his calves using the above routine. And a local football player laughed at him and called him “Bambi” because Jim’s calves were so tiny. So Jim challenged the football player (who had naturally good calves) to try the routine. The football player accepted and Jim put him through the paces. The next day, Jim was back in the gym — but the football player was nowhere to be found. Turns out he was stuck in bed – his calves were so sore he couldn’t even walk! “Bambi” crippled the big football player. In fact, the football player called the doctor to give him some muscle relaxers to help him deal with the soreness. So there you have it: The Jim McLellan Calf Routine. If your mom & dad stuck you with “bambi” calves, then give this routine an honest try for the next 6-8 weeks. You may not enjoy the pain and soreness, but you’ll love the results. Not your first time? Then please click the blue button below to share this post. Thank you. Heh, all I see is me getting up on a 4″ block and somehow pulling something then breaking my neck haha. Sounds grueling though! Ha. I had a friend in college who went in and blasted his calves for an hour. Then went to head down the stairs (weightroom was on the 2nd floor) only to find his legs didn’t quite work as well as expected. He ended up tumbling down the stairs. Didn’t break his neck (thankfully), just bruised his ego. How much weight should be put on the bar if I’m around 160lbs with small calves?